As Turkey moves forward with the controversial purchase of Russia’s most sophisticated and advanced air defense systems, some State Department and Department of Defense officials are privately blaming President Donald Trump for failing to issue a tough ultimatum over the proposed sale, sources with knowledge of the matter tell ABC News. For months, senior officials, including Vice President Mike Pence, Secretary of State Mike Pompeo and acting Defense Secretary Patrick Shanahan, have warned Turkey against choosing a Russian missile system that it is incompatible with the NATO defense systems. They expressed concerns that Turkey, a NATO ally, would purchase a Russian system over the U.S.-made Patriot system. 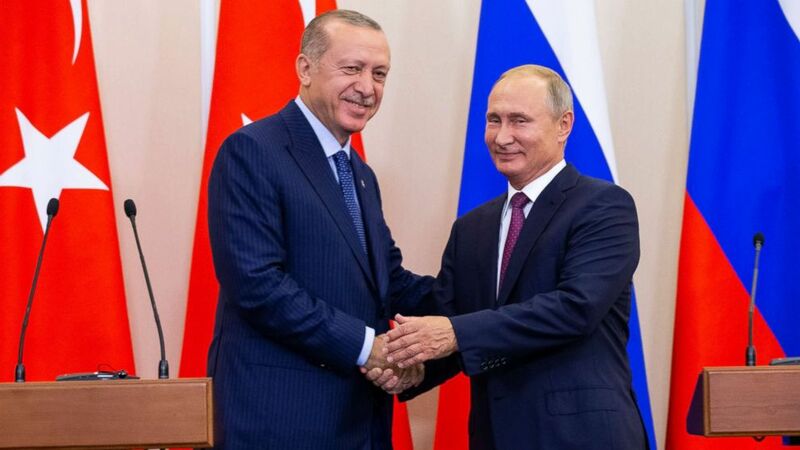 Turkish Prime Minister Recep Tayyip Erdoğan and Russian President Vladimir Putin are expected to meet in Moscow on Monday to discuss the sale of the S-400 system, according to Russian state-run press. Since Erdogan has been personally negotiating the sale, there was hope that pressure from Trump could kill the deal. But during a Feb. 22 call between the two leaders, Erdogan pushed back against Trump’s threat of sanctions, suggesting Congress was infringing on the president’s executive power by issuing sanctions against Turkey over the deal, according to three U.S. officials briefed on the conversation. Erdogan allegedly told Trump that the possibility of sanctions from Congress under Countering America’s Adversaries Through Sanctions Act or CAATSA, is “unconstitutional” because “it takes away your executive power,” according to two officials briefed on the call. Trump responded that he’d talk to Congress, according to two of the officials who had knowledge of the conversation and then moved on from the topic. The president’s response “wasn’t framed so that Erdogan saw what was at stake,” said another official about the call. It was unclear whether the president could have stopped the deal because it’s a sovereign country. The White House did not respond to ABC News’ requests for comment. Ahead of Trump’s call with Erdogan, sources tell ABC News there was a big effort by both State Department and Pentagon officials to prepare the president for the conversation and the potential ramifications. Pompeo and Shanahan also have previously spoken with Erdogan but without any real progress. “That’s why Trump’s role in this is so critical, because Erdogan isn’t listening to the emissaries that he’s met with,” said an official involved in the matter. Military experts worry the system could expose Western defenses to the Russians, since the S-400 potentially could threaten the F-35 fighter jet’s stealth technology, in addition to other U.S. and allied aircraft, officials said. The S-400 is capable of shooting down aircraft, drones and cruise missiles with a range up to 250 miles. China was sanctioned under the same law for purchasing a Russian S-400 system. “I’m not suggesting that Turkey can’t be trusted, but I am saying that you take another risk with your system — with what is probably our most sensitive technology,” said Gen Curtis Scaparrotti, NATO Supreme Allied Commander and the head of U.S. European Command. U.S. officials have warned Turkey that they would cancel their order of 100 F-35 U.S. fighter jets, but Çavuşoğlu said they’re not concerned because of assurances from Trump. “Different statements are coming from different institutions of the United States as well … different and contradictory statements are coming,” Çavuşoğlu said at an event to celebrate the 70th anniversary of NATO in Washington on Wednesday. The U.S. has offered to sell Turkey the American-made Patriot system, but Çavuşoğlu said at the Atlantic Council that they couldn’t get it for 10 years, according to the Associated Press. But publicly, the arms standoff between the countries continues. It’s the latest dispute between the U.S. and Turkey amid tension over American support of Kurdish forces in Syria and their refusal to extradite Erdogan’s rival Fethullah Gulen. The Pentagon last week announced it’s suspending the delivery of equipment for F-35 jets that Turkey is in the process of procuring.